The team at Local SEO Sites would like to announce the exciting launch of Crestview Dental Group. This new dental practice is located in Santa Clara, CA, serving families throughout Santa Clara and the 95050 area. Crestview Dental Group is a family and cosmetic dentistry office, providing comprehensive care to both children and adults. Our team of highly skilled website engineers created and launched their new website, http://www.crestviewdentalgroup.com, to highlight their many services. When designing a website for a dental practice or business, our engineers make sure it is responsive. At Local SEO Sites, we use a mobile first strategy when building websites, due to the high number of prospective patients using smartphones and tablets to search for and connect with local dental practices. Our websites are easy to read from any device, include features like click-to-call and click-for-directions, and it is simple for new patients to schedule appointments. Robust features, compelling imagery, rich content, and easy navigation prompt patients to engage with a dental practice after finding it online. This can lead to an increase in new patient appointments and overall growth in a practice. These are a few of the features we have incorporated into the new website for Crestview Dental Group. As a Santa Clara, CA family dentist office, Crestview Dental Group focuses on preventative dental care, offering services like dental cleanings and examinations, general dentistry, oral cancer screenings, dental extractions, and dental fillings. They are an emergency dentistry office, working with patients on short notice and outside of traditional business hours. As a cosmetic dentist, they also provide patients with full smile makeovers that often include teeth whitening, dental implants, dental veneers, dental crowns, and bridges. 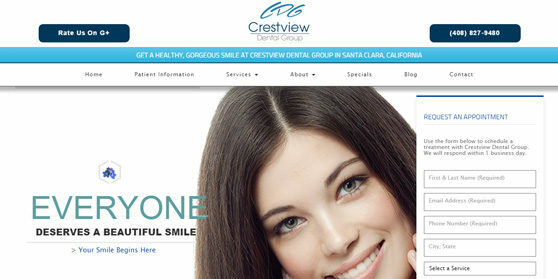 Their new website is making it possible for families throughout Santa Clara to connect with Crestview Dental Group for all their oral health needs. If you are curious about how a new website can positively impact your dental practice, we encourage you to speak with one of our website engineers or SEO specialists. We can perform a site audit and discuss ways your website can work to drive new patient calls and referrals. If you are looking for a new website or online marketing for your practice, be sure to give Local SEO Sites a call.